I can’t help but be on a wedding kick with wedding season coming up! I am nostalgic for my wedding day. I’m having so much fun looking at the wedding pictures and my Park shoot for our anniversary. I found these amazing pillow case covers that are perfect for my husband and I and a multitude of people I know! 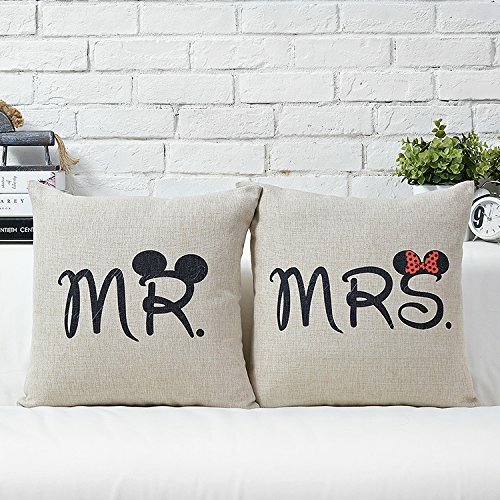 Today’s Disney discovery is a set of “Mr” and “Mrs” pillow cases! The pattern is only available on the front side.It will decorate your room, sofa or lounge every well. The pillow cover is made of high quality linen & cotton fabric and is very durable, environmentally friendly and very comfortable . This cushion cover has an invisible zipper and all seams have been over-locked. It’s easy to dismantle and wash.
Now, you are probably thinking these must be super expensive. These are $9.99 for the set!! If you want to check these out closer, you can find them HERE. Happy shopping, fashionistas!